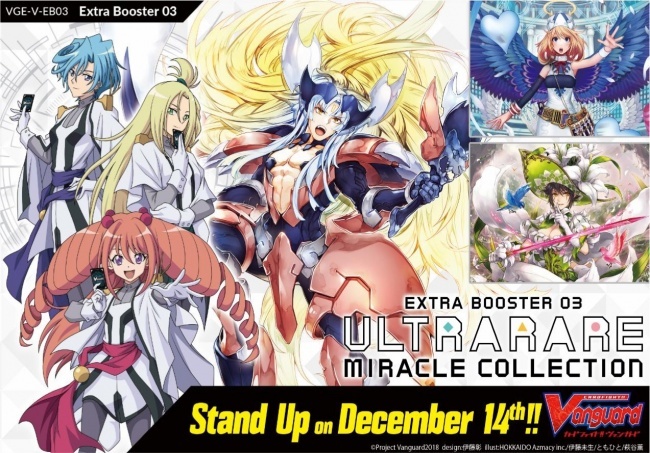 The Ultrarare Miracle Collection booster expansion for Bushiroad’s Cardfight!! Vanguard trading card game will feature a new rarity class called "Ultrarare Rare." 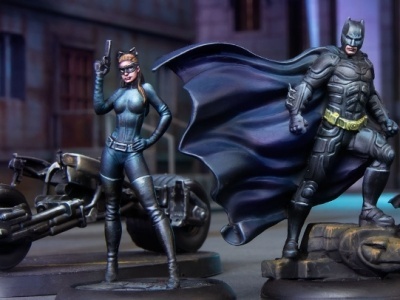 The set will release on December 14. 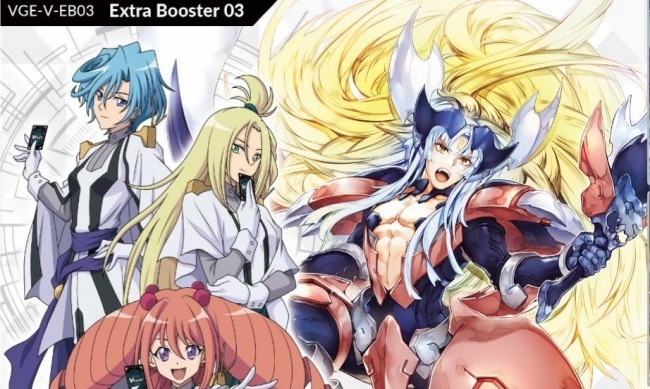 The Ultrarare Miracle Collection features characters drawn from the original Cardfight!! Vanguard comics, and includes cards needed to make "Ultrarare Decks" for three of the main characters: Kourin’s Gold Paladin deck, Suiko’s Angel Feather deck, and Rekka’s Neo Nectar deck. This will also be the first expansion to include Bushiroad’s new "URR" rarity class. The complete set has a total of 66 new cards, including 3 VR, 6 RRR, 9 RR, 15 R, and 33 C rarity cards, along with 3 parallel SVR cards, 3 parallel OR cards, 3 parallel URR cards, and 3 SCR cards. The expansion will be available in seven-card booster packs, and each pack will include two cards with rarities of R or higher. Some random packs will also feature character signature cards. 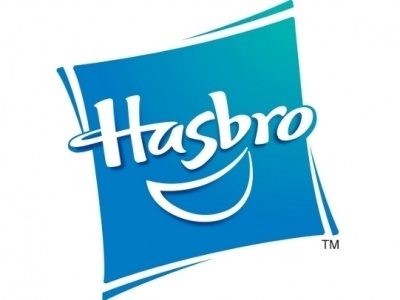 The booster packs will be sold in 12-pack display boxes. Each display will also include a special three-card pack of Gift Markers, with one each of Force, Accel, and Protect cards. Bushiroad is offering retailers who wish to hold a pre-release event during the weekend of December 7 – 9 an Ultrarare Miracle Collection Sneak Preview Kit. The kit includes 39 booster packs, 9 promo cards, and 2 copies of a premium rubber playmat, enough materials for eight participants. Cardfight!! Vanguard continues to be a top seller for Bushiroad, claiming the #6 spot in ICv2’s list of top collectible games last spring (see "Top Collectible Games--Spring 2018"). The Ultrarare Miracle Collection set follows the PSYqualia Strife Mini Booster set, releasing in November (see "Trump Cards Arrive in ‘Mini Booster’ for ‘Cardfight!! Vanguard’").